With shares at all-time highs, Scatec Solar (SSO in Oslo) is facing potentially dire risks to EBITDA, cash flow, and liquidity. A Short position could yield 35-55%+ total return in the coming months. We have discovered potentially catastrophic threats to (a) over 30% of Scatec's operating assets, (b) nearly 40% of its under-construction backlog, and (c) its ability to finance aggressive growth plans. Financial distress at South African utility Eskom could jeopardize 25% of EBITDA, 40% of free cash flow, and Scatec's ability to finance aggressive growth plans. Abrupt policy changes in Egypt threaten 40% of Scatec's under-construction backlog and could wipe out ~50% of its unrestricted cash to maintain the project's solvency. With little to no short interest, we think Scatec's shares are poised to collapse as compliant investors and unquestioning sell-side coverage are forced to reassess their uniformly, overly-optimistic forecasts and price targets. Scatec Solar ASA (SSO-NO) could surrender 25% of its EBITDA, ~40% of its cash flow, and its ability to finance aggressive growth plans owing to the deep financial woes of a large counterparty, South African state-owned utility Eskom. 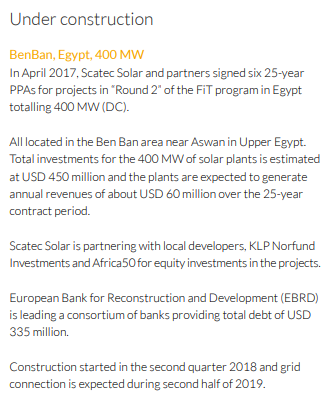 In addition, Scatec's massive under-construction 400MW solar project in Egypt is threatened with state-sanctioned cost increases which could require it to contribute ~50% of its unrestricted cash to maintain the project's solvency. 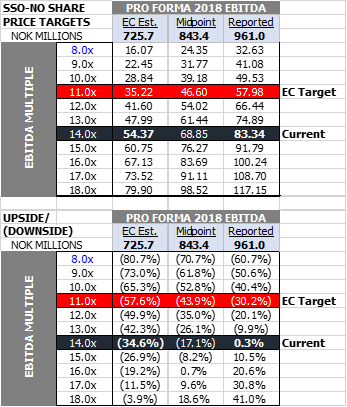 These potentially explosive headwinds likely result in significant reductions to consensus estimates (which forecast a staggering 46% EBITDA CAGR through 2021), trading multiples (SSO currently trades world-leading multiples of ~14.0X 2018 reported EBITDA and ~18.5X our estimate of pro forma EBITDA), and financial liquidity (with ~50% of unrestricted cash potentially consumed by an unexpected capital call on its Egyptian solar mega-project). We believe a short position in Scatec's shares could generate 35%-55%+ total returns in just the coming months, not years, as these issues start to filter through to the sell-side and Scatec investors. We discovered both news items in the international and local press and further corroborated through our deep solar industry network cultivated over 15 years investing in the sector. While our funds have expressed our proprietary thesis through a short position, we suspect that the Scandinavian sell-side and Scatec's investor base remain largely unaware of these impending disruptions to their almost uniformly bullish views. Though we have known Scatec's management team for years (including the CFO since his predecessor company, REC Solar) and respect them, we cannot ignore these existential threats to Scatec's present and future. In terms of executing a short position, shares can be borrowed relatively easily at rates ranging from general collateral to low-single-digit negative rebates. Put options are not currently trading, but many US brokers/custodians are unable to trade or custody European options anyway. Norway-based and publicly-traded Scatec Solar operates as an integrated independent solar power producer (IPP) developing, building, owning, operating, and maintaining its fleet of solar power plants. Currently, Scatec controls 584MW of operating solar plants, is constructing another 1,071MWs, and maintains a backlog of 225MW. They target 3,500MW of installed capacity by the end of 2021. Unlike First Solar (FSLR), NextEra (NEE), Azure Power (AZRE), or Canadian Solar (CSIQ), Scatec focuses on emerging markets such as South Africa, Egypt, Argentina, Brazil, the Czech Republic, Honduras, Jordan, Malaysia, Mozambique, Rwanda, and Ukraine. Though more complicated and riskier to operate in these less developed regions, Scatec endeavors to extract meaningfully higher equity returns leveraging their experience and ability to source low-cost Norwegian and development bank debt financing. To date, Scatec has masterfully executed on this strategy and watched its shares skyrocket ~370% since its October 2014 IPO. Scatec has managed to convince investors and the sell-side to ascribe a developed market valuation to its emerging market risks as Scatec trades at a significant premium to other solar IPPs including U.S. players. Sitting near its all-time highs, Scatec commands a NOK9,449M (US$1.1B) market capitalization and NOK13,427 (US$1.6B) enterprise value while trading at 14.0X 2018 reported proportionate EBITDA (incorporates EBITDA from unconsolidated projects where Scatec holds under 50% sponsor equity ownership), 5.1% cash flow to equity yield, and a 1.1% dividend yield. As noted above, Scatec operates a 584MW fleet of solar assets as of 12/31/2018. Of this 584MW, 190MW (32.5%) sit in South Africa. 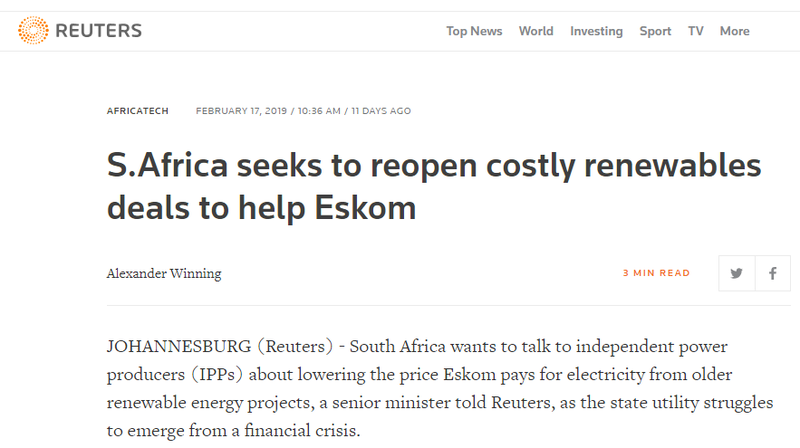 Awarded under the South African Renewable Energy Independent Power Producer (REIPP) in 2011 and 2012, these projects were extended very generous power purchase agreements (PPAs) with state-owned utility Eskom. For context, 2011 and 2012 vintage PPAs are receiving Rand R3.84 per kWh R1.67 per kWh, respectively, as compared to R0.76-R0.96 in the latest rounds. Generally, we would view above-market contracts with state-owned entities as low-risk, valuable assets, but in this case, the above-market contracts are coming back to haunt Scatec. Eskom is facing mounting financial stress, and in an election year, South Africa's President Cyril Ramaphosa is seeking to improve Eskom's financial standing and placate powerful unions. To this end, he is seeking to renegotiate these above-market solar PPAs. We also highlight that Pacific Gas and Electric (PG&E), the largest utility in California, is seeking to renegotiate above-market renewable energy power purchase agreements as part of its financial restructuring. If a (formerly) investment grade U.S. utility can reopen uneconomic renewable energy contracts, then a financially distressed state-owned utility in an emerging market (in an election year) surely can follow its developed market brethren. In 2018, Scatec derived ~30% of its EBITDA and 18% of its cash flow to equity from the 190MW of South African assets owing to a recognized blended PPA rate of R3.1489. 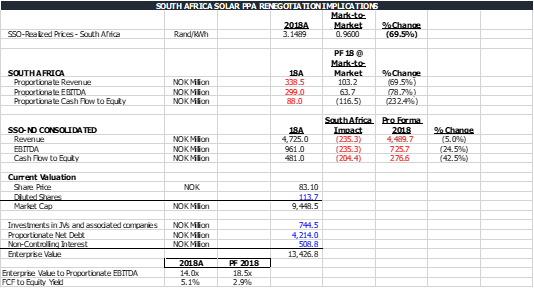 If we re-mark these PPAs to current market prices (as government officials have intimated), Scatec's realized PPA price would collapse nearly 70%, South African EBITDA would plummet nearly 80%, and cash flow to equity would turn negative as debt service more than consumes EBITDA. Basically, Scatec's sponsor equity stake would be wiped out completely. 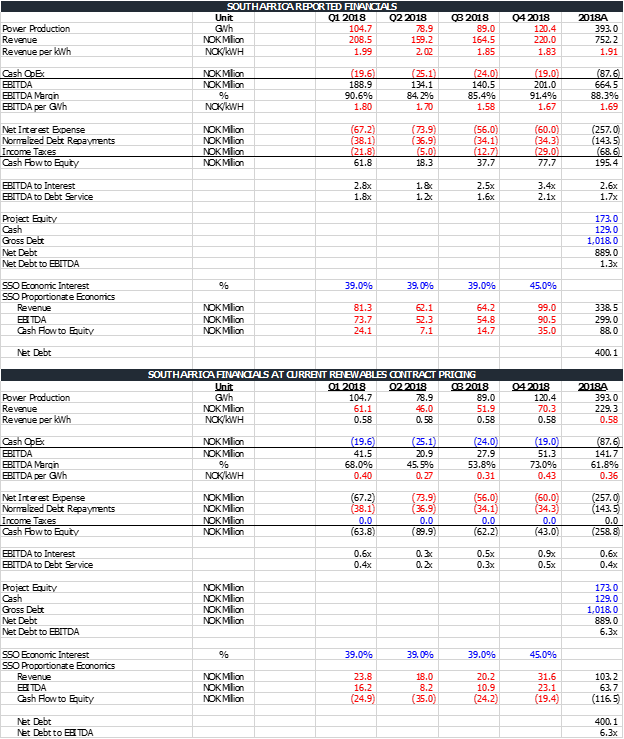 Overall, Scatec's consolidated proportionate EBITDA would drop 25% while cash flow to equity would dive over 40%. Also, SSO net debt to EBITDA would jump from ~4.4X at the end of 2018 to nearly 6.0X. With sell-side estimates showing growth for as far as the eye can see, we don't think this risk is captured by consensus. And with increased leverage, we question Scatec's ability to fund growth without a significant equity raise. We note that SSO carries some insurance against contract non-performance in South Africa - 90% of its equity investment is covered for 15 years. However, SSO has only invested NOK173M of project equity into these assets versus annual proportionate EBITDA of NOK299M (nearly 2X the equity investment). While SSO may recover a small amount of their loss, they will still lose a preponderance of the EBITDA and cash flow from the South African assets. One final note on South Africa, Scatec increased its stake in these assets from 39% to 45% on November 1, 2018, thereby increasing their exposure just as the equity value of these assets is set collapse. While its operating portfolio is being bombarded in South Africa, Scatec's under-construction Egypt mega-project is getting battered in north Africa. Scatec is currently constructing 1,071MW of solar projects across the globe. Unfortunately, 400MW (37.3%) are located in Egypt. In late February, Egyptian press reported that the government is putting an incremental 25% of project costs to developers in its signature 1,465MW Benban solar park of which 400MW is being developed by Scatec. Per their agreement with the government, Scatec (and all developers in the park) will share the burden of any increased costs. It appears that Scatec and its 49% partner will need to fund this unforeseen cost increase by June 2019. Scatec has publicly disclosed that this project will require US$450M of capital expenditure of which $335M will be funded by a consortium of development banks led by the European Bank for Reconstruction and Development (EBRD). 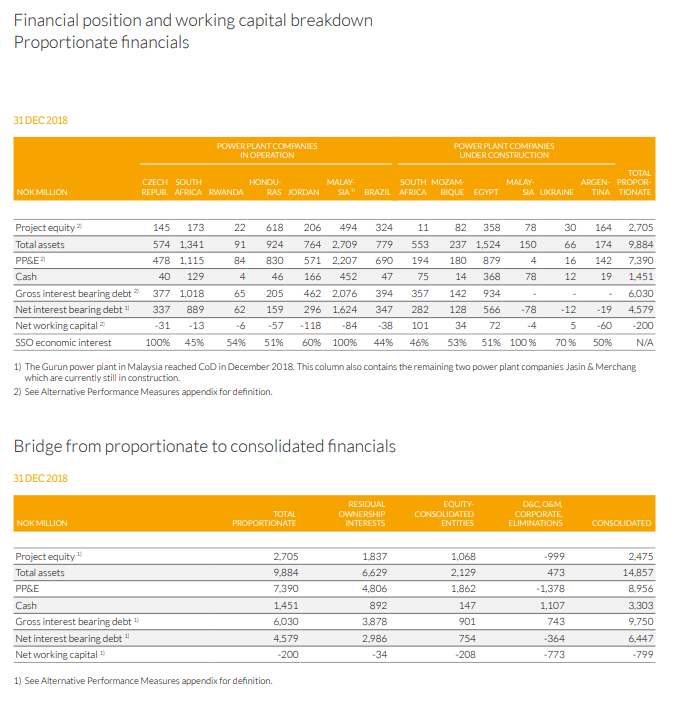 We estimate an incremental US$112.5M of sponsor capital contributions to maintain project solvency meaning Scatec needs to invest an incremental NOK490.2M (US$57.4M) or 15% of is total cash balance and nearly 50% of its unrestricted cash balance. This unexpected cash drain will dramatically impact Scatec's ability to fund its robust construction backlog and pipeline and all but ensures that Scatec will not achieve lofty sell-side and investor expectations in 2019 and beyond. We value Scatec at NOK35 to NOK54 versus its current trading price of NOK83.10 representing 35% to 55% upside from a Short position. 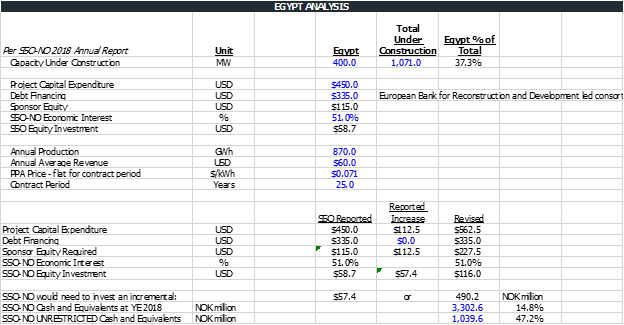 We note that our valuation excludes any negative impact from Egypt as the incremental spending likely impacts the balance sheet more than the P&L. Today, Scatec trades at 14.0X 2018 reported EBITDA (and 18.5X EBITDA with South Africa adjustments). This compares to ~10.8X for solar IPPs. Applying the current 14.0X multiple to our South Africa adjusted EBITDA yields a share price of NOK54. However, we believe that Scatec's premium multiple will erode as cracks begin to appear in this beloved story. At the peer ~11.0X multiple on our South Africa adjusted EBITDA, Scatec is worth NOK35. With significant and increasing leverage combined with mounting risks, we think Scatec could break through NOK35. 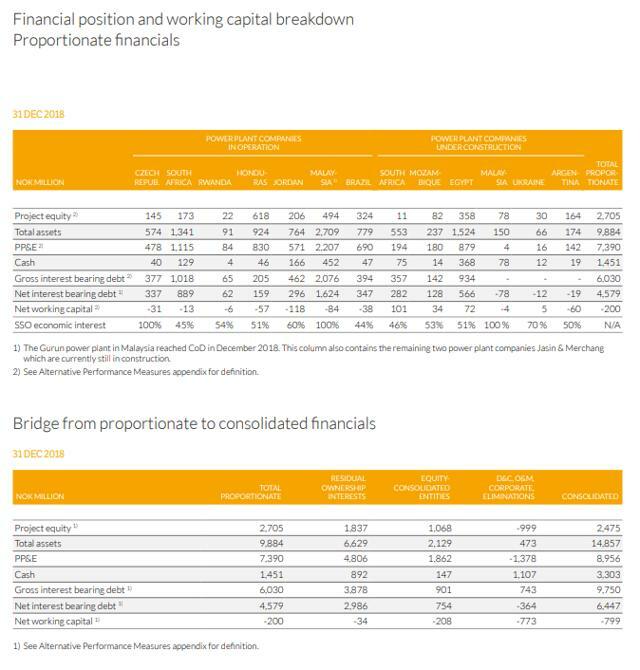 For more details on the EBITDA estimates below, please see our South African PPA renegotiation analysis above. Disclosure: I am/we are short SCATEC. I wrote this article myself, and it expresses my own opinions. I am not receiving compensation for it (other than from Seeking Alpha). I have no business relationship with any company whose stock is mentioned in this article.